Last year I read and enjoyed Dying in the Wool, the first of Frances Brody’s series of historical crime fiction books set in 1920s Yorkshire and featuring Kate Shackleton. The second book, A Medal for Murder is even better and I was thoroughly immersed in the mystery. A pawn shop robbery brings Kate and her assistant Jim Sykes, an ex-policeman, their second case. It leads on to her discovery of a dead body, that of Lawrence Milner, outside a Harrogate theatre where Kate had been watching a production of a dramatisation of Arnold Bennett’s novel, Anna of the Five Towns. Then Captain Wolfendale, a Boer War veteran asks Kate to find his granddaughter, Lucy, who had starred in the play, as she has disappeared and he had received a ransom note. The murder brings Kate into contact again with Inspector Marcus Charles of Scotland Yard (she had first met him in Dying in the Wool). The book is told from the different characters’ perspective, but mainly from Kate’s, with flashbacks to the Boer War at the turn of the century. This is a detailed, complex plot which kept me guessing almost to the end about the identity of the murderer. What is Captain Wolfendale hiding in his attic that he doesn’t want Kate to see? Just what is his relationship with Lawrence Milner who had also fought in the Boer War? How/is the pawn shop robbery connected to the murder? Will Lucy be rescued? And why doesn’t Dan Root, a watch maker, who also rents a room in the Captain’s house want to Kate to see inside his workroom? 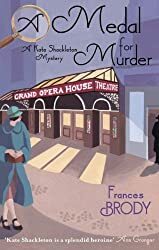 There is so much going on in this book, and yet it was easy to read and each sub-plot fitted in so well with the main mystery that I didn’t get confused – I just couldn’t see who could have killed Milner. I had several suspects, all of whom turned out to be innocent of the crime. I liked the historical setting and the characters rang true. I’m left wondering whether Kate’s relationship with Inspector Charles will develop further, and whether she will ever hear what happened to her husband, reported missing in the 1914-18 War. For more information about the author and her books see Frances Brody’s blog and website. Reading Challenges: Mount TBR Reading Challenge, 10 Books of Summer, Historical Fiction Reading Challenge. I’m so glad you enjoyed The Redemption of Alexander Seaton. You’ve reminded me that I want to read more of S G Maclean’s books – I’ve read the third in her ‘Alexander Seaton’ series, Crucible which is also very good. Her style of writing suits me perfectly. I hope you like the Kate Shackleton books if you get round to reading them – they’re good too but not quite as engrossing as the Alexander Seaton ones. I’m glad you enjoyed this one, Margaret. I do like historical mysteries, and this one certainly evokes a really important era.